The gas explosions that jolted Kaohsiung were the product of long-term neglect of public safety. They pose a series of huge challenges to governance at the central and local level that will be hard to overcome. The spot where the curve on the chart plummets abruptly is labeled with three words: "Pressure falls abnormally." The sudden plunge occurred on the night of July 31 at 8:43 and 21 seconds – a moment in time certain to leave its mark on Taiwan's history forever. Chen Chin-der, the director of Kaohsiung's Environmental Protection Bureau, traces the line on the chart as he explains that LCY Chemical Corp.'s monitoring data clearly recorded an abnormal drop in pressure at that exact moment in a pipeline conveying propylene to its factory. Over the critical 132 minutes that followed, nearly 10 tons of propylene gas leaked from the pipeline without LCY Chemical taking any action to stop it, triggering the worst series of gas explosions ever seen in Taiwan. The blasts left at least 30 people dead and more than 300 injured. What kind of message did these tragic explosions that cost people their lives send to Taiwan? In the future, what steps are needed to ensure the most basic level of public safety? "Over the past few years, we have focused on preventing, avoiding and reducing the impact of disasters, with the efforts targeted at typhoons and extreme rainfall after learning our lesson the hard way," says a somber Syu Li-ming, the chairman of Kaohsiung's Research, Development and Evaluation Commission (RDEC). After a long pause, he adds in a voice tinged with anguish: "In the future, we will have to face the collective risks brought to the city by industrialization." These risks exist all around residents of the biggest city in southern Taiwan. Based on construction drawings from over the past 12 years, Kaohsiung's Public Works Bureau estimates that there are more than 120,000 kilometers of electric cables and pipes for water, natural gas and chemical raw materials buried under the Kaohsiung metropolitan area. By comparison, Kaohsiung has only 3,500 kilometers of major thoroughfares under which the pipes can be installed. ("Major thoroughfares" must be more than 6 meters wide.) This translates to roughly 34 kilometers of potentially dangerous pipes and cables per kilometer of roadway, a considerable burden and risk for the city. And that does not account for pipes installed haphazardly before 2003. This extremely dense piping network has handcuffed and preordained Kaohsiung's destiny. "It's fate," laments one city official, because as the city developed, its old downtown area was tightly surrounded by heavy industry – the Nanzih Export Processing Zone and state-run oil company CPC Corp.'s main oil refinery northwest of the city, the Jen Ta Industrial Park to the northeast, and the Dafa Industrial Park, Linyuan Industrial Park, and Kaohsiung LinHai Industrial Park to the south. And all of the oil and other raw materials feeding the city's industrial complex enter through Kaohsiung Port in the eastern part of the city. Those raw materials are either trucked to their customers or sent through pipelines to the neighboring industrial parks. "From the drawings we have, there may be no way for us to check (the pipes' locations) relative to existing city streets," says Vincent Tseng, the director-general of Kaohsiung's Economic Development Bureau. That's because the city has developed and changed so quickly, Tseng says, that many pipes laid down long ago have ended up under locations where people converge, such as night markets or residential areas. This failure of city planning and the underground risks threatening the city were only exposed to most Kaohsiung residents by the deadly gas explosions. "Because the conveyance pipes are buried underground, it's easy to ignore them. In transportation studies, these are known as 'hidden giants,'" says Huang Tay-lin, an associate professor in Chang Jung Christian University's Aviation and Maritime Transportation Management Department. These underground "hidden giants" have suddenly sprung up to threaten public safety. "The area of a factory's operations falls under the category of industrial safety. Pipes extending from the factory area into the city involve public safety," says Niven Huang, general manager of KPMG Sustainability Consulting Co. He explains that top executives have only concerned themselves with safety at their factories while ignoring the dangers of transporting materials through underground pipelines. Even government agencies at both the central and local level have lacked a clear management system and inspection mechanism to deal with piping systems outside factory premises. Seven government agencies, from the Industrial Development Bureau under the Ministry of Economic Affairs to the Kaohsiung Public Works Bureau, have to get involved when a company wants to install a pipeline in the Kaohsiung area and have it approved. But there are no laws covering oversight responsibilities, and no agencies have been specifically given oversight powers. One environmental official who spoke on condition of anonymity said manufacturers directly monitor safety only by keeping tabs on their pipelines' capacity and pressure. Actual maintenance is performed by outside contractors, in effect contracting out "responsibility." But once a pipe has corroded and begins leaking, it's too late for the pipeline operators to salvage the situation. Surrounded by petrochemical factories and industrial parks, Kaohsiung's safety record has been anything but brilliant. Citizen of the Earth Taiwan calculated that from 1991 to 2013, CPC Corp.'s naphtha cracker complexes in Kaohsiung alone had 27 safety incidents, more than one a year, and the thousands of factories in the area create untold amounts of air and water pollution. The Kaohsiung disaster exposed a tug-of-war between economic development and environmental safety, which has left time bombs hidden everywhere and limits the city's imagination on how to shape its future. After the gas explosions, Kaohsiung Mayor Chen Chu personally took charge of an emergency response center and called meeting after meeting to deal with the crisis. "In the area of safety, our fate is tied together," Chen said at one of the meetings, looking around the venue at the various officials and representatives of CPC Corp. and China Petrochemical Development Corporation in attendance. "We must, we absolutely must work extremely hard. There's nothing more important than safety," she implored, emphatic in her appeal because aside from having implications for people's lives and property, safety also represents the foundation of a city's economic vitality. On the weekend following the blasts, the Dream Mall, one of the city's leisure hubs, still draped its huge Ferris wheel in colorful lights, but the normal cacophony from visitors was absent, replaced by the hum of a few cars driving by. The vast parking lot around the Mall remains swathed in solitude. Nobody knows when the customers who have disappeared and the economy that has absorbed a severe blow will recover, because even nearly a week after the blasts, Kaohsiung was a shell of its former self, a city still living in fear. To extricate the city from fear, calming the public is priority No. 1. "Pipelines buried underneath a city involve public safety," KPMG's Huang says, arguing that the people's right to know must be respected, because otherwise backlashes will far more easily erupt in the future. To calm the nerves of Kaohsiung residents, the city government pledged to post drawings online of the city's tens of thousands of kilometers of pipes and conduits once they were fully collated. It asked the Ministry of Economic Affairs to provide complete piping drawings from state-run enterprises and industrial parks in the Kaohsiung area, and it also insisted that all operators put in place a mechanism to notify authorities immediately when an abnormality is detected. "Only through cooperation can this city be safe," Mayor Chen emphasized. Her message signaled that more than compiling scientific drawings was necessary; even more important was a change in mindset among companies, local authorities and central government agencies. Yet, even those steps remain insufficient to ensure a safe environment. Beyond determining responsibility, the government must also develop ways to prevent such a tragedy from happening again. One possibility is to learn from the United States, which set up the National Transportation Safety Board to investigate accidents in all major modes of transportation – aviation, railroad, highway, marine and pipeline. Whether it involves gases, liquids or chemical materials, anything traveling through a pipeline falls under the NTSB's jurisdiction, and when an accident occurs, the agency responds immediately and conducts an independent investigation. In Taiwan, air travel is the only form of transportation that has an agency dedicated to its safety, in this case the Aviation Safety Council. "The lines of responsibility for managing pipelines in Taiwan are unclear," says Chang Jung Christian University's Huang, who suggests setting up an independent council like the NTSB to investigate the situation and make suggestions on how to improve safety. That responsibility ideally should not be handled by either the Ministry of Economic Affairs or the Kaohsiung government, Huang says, because their impartiality would be called into question. A sound disaster prevention and relief system cannot afford to be neglected if a city is to be safe. To former interior minister Lee Hong-yuan, an expert on preventing and handling disasters, the Kaohsiung tragedy suggests plenty of room for improvement. "Disaster prevention and relief is a specialized area of expertise. Kaohsiung's Fire Bureau (the primary respondent to the Kaohsiung blasts) and the National Fire Agency only know how to put out fires. They don't know how to handle disasters," he says, pointing to the need for integrating disaster relief systems and laws. The lack of such integration was a main reason why the Kaohsiung blasts cost several firefighters their lives, Lee believes. Part of the problem is that Taiwan does not have an agency directly responsible for disaster prevention whose task is to compile information on underground pipelines, critical infrastructure, escape and evacuation equipment, and building blueprints in a single database, not to mention create a unified disaster prevention monitoring system. Once an accident occurs, the Environmental Protection Administration's Hazardous Materials Emergency Response Team must spend time testing for potentially toxic materials, which delays an evacuation of the affected area. And neither the Industrial Development Bureau, which is in charge of Taiwan's industrial parks, nor Kaohsiung's Public Works Bureau, which is responsible for road construction, knows exactly where pipelines are located. In addition, the responsibility for disaster prevention and relief is divided among different agencies depending on the nature of the disaster. When a typhoon wreaks havoc, the Ministry of the Interior calls the shots; when a major problem occurs in a long tunnel, the National Freeway Bureau under the Transportation Ministry takes command; and in the cases of nuclear or chemical disasters, other agencies are in charge. "Everybody really gives it their best, but their effort and resources are not directed at where they are most useful," Lee says with a sigh. National disaster prevention efforts cannot succeed without coordinated policies and an overall command system. Without these, responses to major disasters can be hamstrung, leaving firefighters, who lack specialized training and equipment, to deal with the problem and sacrifice their lives in vain. Can Kaohsiung Do without the Petrochemical Sector? 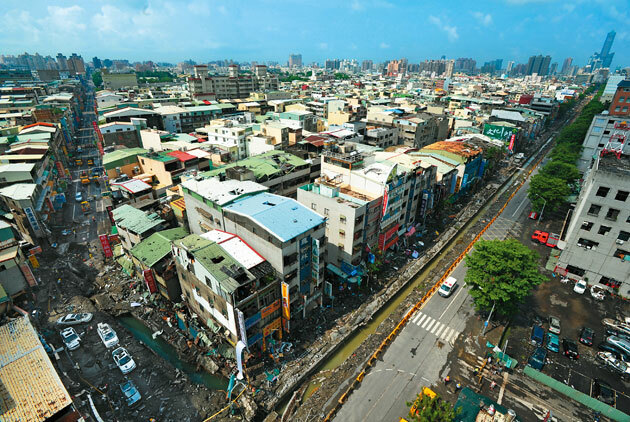 With Kaohsiung facing a long road to recovery (which the mayor projected at three and a half years), Lee suggests that the city quickly commission structural experts to determine the structural integrity of the buildings in the disaster zone. It should use some of the money donated for disaster relief to help residents rent places to live and launch an urban renewal and regeneration plan to rebuild the affected area, he says. Of greater consequence for the long term, the Cabinet and Kaohsiung city government need to sit down and ponder the direction of both the country's and the city's economic development. The question is, with 70 percent of the petrochemical industry deeply rooted in the Kaohsiung metropolitan area, can the city afford to live without the sector? The answer seems to be, "not yet." "We have always hoped to build Kaohsiung into a 'resilient city,'" says Kaohsiung RDEC chairman Syu, who is one of the mayor's most important advisers. The city must first acknowledge both how indispensable heavy industry is and the potential risk it brings before planning for the future, he says. What that suggests is that, whether from an environmental, public safety or economic development perspective, Kaohsiung authorities see industrial transformation as essential, in order to reduce dependency on the petrochemical industry and heavy industry. "Because of this accident, we believe more than ever that while transformation can be extremely difficult, it's something we have to pursue," Syu explains. No government in power can withstand the pain from the high employment that would be caused by an abrupt transition. The only option open to Kaohsiung if it hopes to reengineer itself is soliciting new industries – featuring high added value, low pollution and low risk – to invest in the city and absorb those employed in heavy industry businesses. Kaohsiung has already started on that new development path, encouraging investment in the tourism, digital content, yacht making, exhibition, and creative and cultural sectors. "Making the transition from an industrial city to a livable city isn't just a matter of improving the quality of life. For Kaohsiung, it's a matter of survival," Syu says. The disaster that struck Kaohsiung was not unique to the city and could have happened in any one of the country's other 22 cities and counties. Everybody in Taiwan needs to consider that a city cannot survive without an economy but that the economy must develop in a way that respects public safety. For Kaohsiung residents, the dilemma can be easily framed as a choice between safety and prosperity, but in fact it should not be an either/or proposition. Though they resulted in the deaths of more than two dozen people and widespread destruction of city streets, the Kaohsiung explosions offer the city a new opportunity to look at its future, but the pain and sacrifices involved in the transition must be assumed by everybody collectively. Next Petrochemicals: Welcome Worn Out?